The Schulman Numismatists, auctioneers in Amsterdam, have included a scarce and very rare gold coin minted in 1982 which commemorated the 200th year of Dutch-American friendship that will go under the hammer on the 29th and 30th June. It is understood that the 50-gulden coin was presented to President Ronald Reagan for the occasion of the state visit of HM Queen Beatrix and HRH Prince Claus, which also marked the 200th year of friendship between the two countries. Today we recognize not only the 200th anniversary of our relations but also the lasting imprint your country has made on America. Your Majesty, who can forget that New York was first New Amsterdam. This was in regard to the historical fact that the United States of America and the Kingdom of the Netherlands shared 200 years of diplomatic relations, an achievement celebrated by both nations. In addition to visiting Philadelphia and New York, they were also received by Roland and Nancy Reagan at the White House, during which, official gifts were exchanged during this diplomatic visit. Prince Claus received a red leather-bound book with gold imprint depicting photos of Washington D.C. The royal couple presented Ronald Reagan with a pattern (or example) of the 50-gulden commemorative coin struck for the occasion in the Netherlands, but this coin was minted in gold. 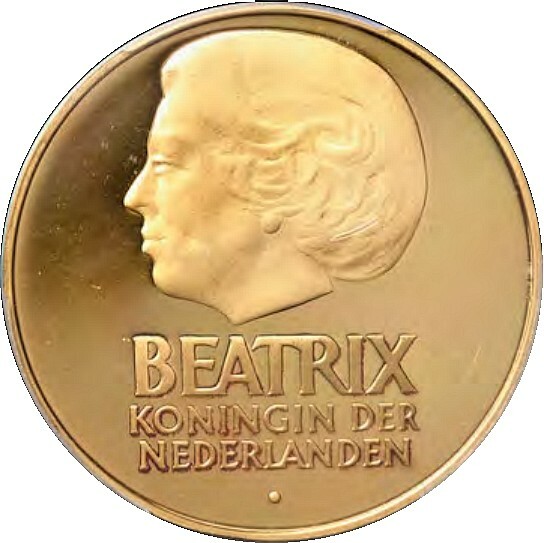 The obverse carried an effigy of Queen Beatrix facing in the left direction with her legend placed below the portrait in three lines. The reverse design integrated the symbols of the two countries into one conjoined design, the heads of a lion and an eagle, with the denomination of 50 GULDEN and the commemorative years 1782 – 1982 placed along the upper left edge. This anniversary coin was also the first time this denomination had been minted and was also released as a circulating sterling silver commemorative coin. According to ex-employees of the Dutch State Mint, a total of six gold pieces were minted and placed in wooden presentation cases with the Dutch coat-of-arms. The actual mintage and how many pieces were disposed of have never been confirmed. To date, only this example has been seen in a public sale. It is understood this very coin was previously offered for sale by auction in 2016 and was written about in an educational article published in the Muntkoerier magazine by authors Jacco Scheper and Marcel van der Beek. The consignor acquired the coin in early September 2015 from Nancy Reagan’s former designer, who worked with her to redecorate the White House. It is general procedure that the Dutch State Mint retains two examples of any numismatic item struck by their facilities and it is understood that this was done with the gold patterns of the 50-gulden coins issued in 1990 and 1988. Two specimens reside in the Dutch National Numismatic Collection, however, of the 1982 pattern, none have been preserved. The law of the 10th March 1982, regarding the implementations of 50-gulden pieces and the royal approval of this first 50-gulden, which was signed into law on the 29th of May 1982, only mentions the silver examples. 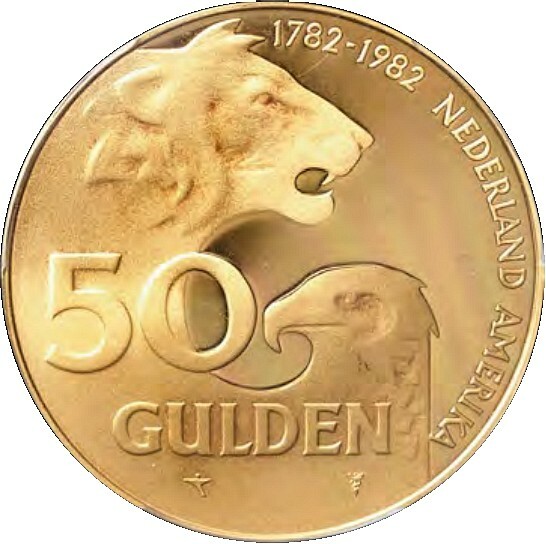 The whereabouts of the other rumoured 1982-dated 50-gulden five gold examples remains a mystery. The coin offered by Schulman Numismatists is also the only graded example according to current PCGS and NGC population reports. This coin is graded MS-64. 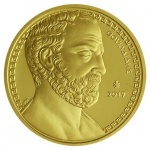 However, as the coin is visibly Prooflike or Proof, the grade description is conservative and incorrect. In 1982, the patterns were struck with specially polished dies and held the description of “Prooflike.” The reserve price of this coin is listed at €20,000. For additional information on this coin and others included in their next auction 356 from the 29th to the 30th June, please visit their website where you may download the catalogue.